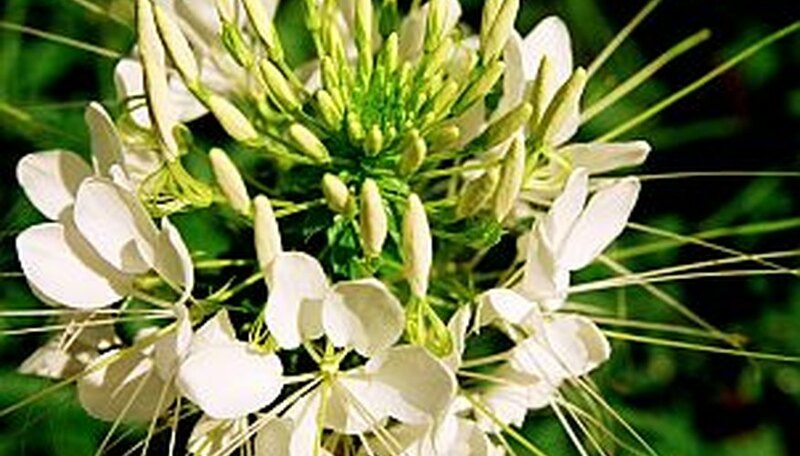 Some gardeners are more familiar with the name spider flower and others know the name cleome. Whatever you call this tall, stately flower with its delicate blossoms, it is a beautiful addition to any flower garden. Start cleome from seeds early in the spring indoors or later in the spring outdoors for a colorful summer display. Cleome will self-sow in the autumn and return the following spring. Place approximately 1/2 cup of peat moss into a small sealing plastic bag, and add the seeds to the bag. Seal the bag and place it in the vegetable crisper in the refrigerator. Keep the seeds in the refrigerator for approximately one week prior to planting. This is called stratification and helps prepare the seeds for germination. Fill the seed-starting tray with potting soil. Place the seeds onto the surface of the potting soil, spacing them approximately 2 inches apart. Cover the seeds with a light dusting of soil. Spray the surface of the soil lightly with a spray bottle. Spray the soil surface each morning with warm water to add moisture and increase the soil temperature for germination. Keep the seed-starting tray as warm as possible during germination. Cleome seeds prefer daytime temperatures around 85 degrees and overnight temperatures around 65 degrees. Place the seed tray under a grow light after seedlings emerge. Monitor the growth, and when you have seedlings with four true leaves, move them to their own small containers. Continue to water and provide light for both the seedlings in the individual containers and the seedlings in the seeding tray. Prepare a sunny growing area by working the soil with a garden spade down to a depth of approximately 5 inches. Add 1 to 2 inches of compost to the top of the garden soil, and work this in with the garden spade to incorporate it fully. Move the seedlings outdoors after approximately four weeks of growing indoors. Plant the seedlings 12 inches apart in the prepared growing area, planting them at the same depth as they were growing in the temporary containers. Water the transplanted seedlings generously. Prepare the seeds for planting by performing Step 1 above. Work a sunny planting area in the spring when the soil temperature is above 70 degrees. Use a garden spade to work the soil down to a depth of at least 5 inches. Add 1 to 2 inches of compost and work this in well. Plant the cleome seeds 12 inches apart in the prepared area. Cover the seeds with a light dusting of soil, and keep the soil moist during germination. Watch for seedlings to emerge from the soil. Pinch off the bottom leaves of the seedlings to encourage a stronger plant. Keep the soil evenly moist while the seedlings are establishing. Provide water when the weather is dry. Water cleomes one time per week if 1 inch of rain does not fall. Fertilize cleomes in the middle of the growing season. Add the fertilizer to the soil around the cleomes according to package recommendations for the size of your growing area. Work the fertilizer in with a hand-held spade. Watch for blooms in the middle of the summer. After the cleomes finish blooming, leave the spent blossoms on the stalks to allow self-sowing for next spring. To limit self-sowing, remove some of the spent blossoms. To prevent self-sowing, remove all of the spent blossoms.